Panhard was a customer of Jaeger. The last real Panhards, 24 CT and the CD, had nice dashes with round instruments. On the first picture the difference between the dash of the B and C and the CT models. 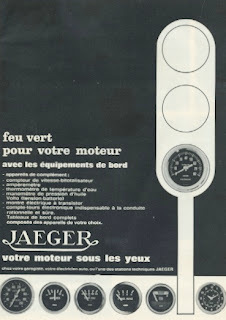 In the first year of the jaegertableau the ampèremeter came from the Panhard range! On the last picture of a tableau fot the Peugeot 404 cabriolet there are even 2 mano’s with the Panhard lay-out. Jaeger made for the Simca 1000 (1961-1978) one of the first special tableaux. in 1962 the 1000 coupe by Bertone came on the market and was using the kit of Jaeger instruments as later came in the tableau. For the Simca 1200 coupe (1967-1972) were new instruments set in place. 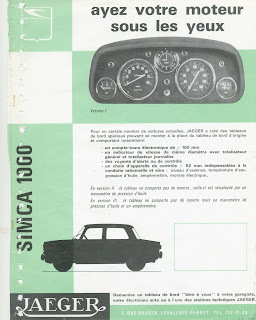 The first picture is a Jaeger brochure for the Simca 1000 tableau, the second for the coupe Bertone and further a picture how the instruments were arranged and another with different pointers. The next one is for the TI 1100. 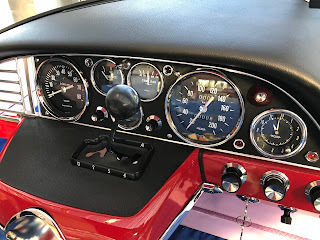 Then a picture from an Simca 1000 Rally 1 and the Coupe 1200S, 1969, and the last one is for the Rally 2, but here are Veglia instruments used. In this nice event there were a lot of Jaeger instruments to see and for sale!